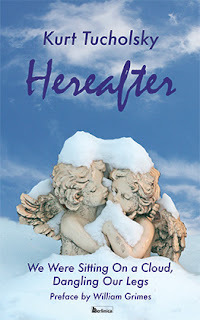 Very exciting news: We will have a new book out by famed Weimar writer Kurt Tucholsky; Hereafter. We Were Sitting on the Cloud, Dangling Our Legs. It is a charming little hardcover about how Kurt Tucholsky, then living in Paris, imagined heaven, debating philosophy with his fellow angels, watching meteors, flying to the mountain of laughter, meeting Gandhi at God's parties, and thinking about what he left on earth. The preface is by esteemed author William Grimes. So, the book is near-finished, but not quite, and this is how you come in! We have two sets of headlines, and we are not sure which one is the best. If you want to participate in a poll, email us at info (at) berlinica (dot) com, and we will send you both versions to judge. In addition, we will send all volunteers a free ebook as soon as it is available. Let your voice be heard!